Gold and other precious metals prices fell Tuesday, as a rallying dollar, fresh worries over China belt-tightening, and higher margin requirements by CME Group were attributed for the losses. "Comex gold prices ended sharply lower Tuesday, on some fresh worries about the Chinese government tightening monetary policy that prompted a general sell off in the commodity markets," noted Jim Wyckoff of Kitco News. "Increased margin requirements for the precious metals futures and a stronger U.S. dollar also weighed on gold and the other precious metals," said Wyckoff. The biggest losers were palladium and silver. The metals suffered drops in prices of 5.2 and 3.3 percent, respectively. Gold prices for December delivery lost $30.10, or 2.2 percent, to $1,338.40 an ounce. Gold hit an intraday high of $1,364.30 and bottomed at $1,329.00 — its lowest price since Nov. 3. The yellow metal is still 22.1 percent higher in 2010. December silver prices plunged 85.9 cents to close at $25.233 an ounce. The metal ranged between $24.980 and $25.850. Silver prices dived 7.1 percent last Wednesday after the Chicago Mercantile Exchange (CME) increased silver margins from $5,000 to $6,000. Silver is up 49.8 percent this year. Platinum prices for January delivery fell $40.10, or 2.4 percent, to settle at $1,645.70 an ounce. The metal ranged from $1,638.10 to $1,679.10. Prices have increased 11.9 percent in 2010. Palladium prices for December delivery plummeted $35.40 to $645.90 an ounce. It ranged between $636.00 and $678.75. Palladium has shot up 58.0 percent this year. 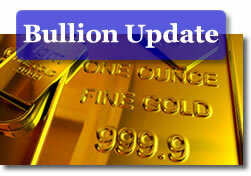 In PM London gold prices, the benchmark gold Fix was $1,349.00 an ounce for a loss of $19.50 from the price on Monday. "Commodities generally are on the back foot at the moment … everything feels a bit on hold. We’ve had a pretty volatile period over the last couple of weeks and things seem to have blown themselves out for the time being," Scotia Moccatta head of precious metals Simon Weeks, said and was quoted on Reuters. "Gold is wrapped up in the commodities story, which is often the case in the short term and then it often recovers as a currency afterwards." London silver was fixed to $25.480 an ounce, down 53 cents. Platinum was $1,658.00 an ounce for a loss of $17.00. Palladium’s fixing came in at $661.00 an ounce, down $14.00. In gold and silver coin news, United States Mint bullion sales are on pace to easily surpass their October figures. One ounce Gold Eagle coins gained 2,500 on Tuesday, adding to the 9,500 increase the U.S. Mint reported on Monday. Their November total of 49,000 is 40,500 from matching last month’s tally. More impressive, bullion Silver Eagle coins advanced 250,000 on top of the 525,000 increase from the prior day. They stand at 2,715,000 for the month, which is 435,000 away from matching October.